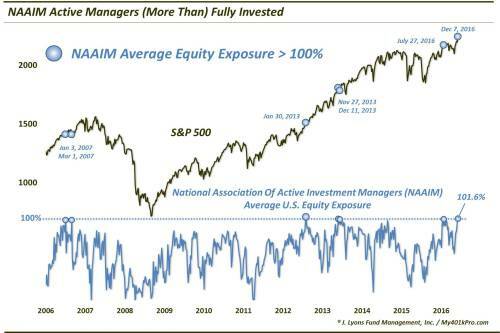 Active managers have adopted an average of over 100% exposue to stocks; such exuberance has not been necessarily represented a poor bet in the past, however. The jury is out on whether investors have embraced the “Trump Rally”. While there is some evidence that investors and money managers remain under-invested, there is probably more evidence to the contrary. From jacked-up surveys to record ETF inflows, it’s probably safer to conclude that folks are pretty enthusiastic about stocks right now. One specific example comes from the National Association of Active Investment Managers (NAAIM) survey of active manager equity exposure. This week, based on the survey, these active managers have an average of 101.6% exposure to equities. I’d say that’s pretty high. Now, don’t go and sell all of your stocks just yet based on a contrarian analysis of this data point. That’s because the previous “all in” bets by these managers didn’t exactly lead to disastrous results. In fact, on a 3-week, 1-month and 6-month basis, the S&P 500 was higher each time following these >100% readings. And only this past July’s reading led to a negative 3-month return, barely. So there certainly may be valid reasons to expect a pause in the enexorable Trump Rally, overexuberance by these NAAIM managers isn’t necesarily one of them.